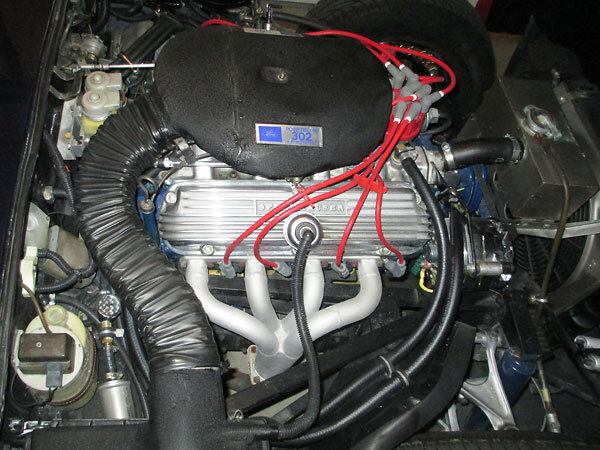 Engine: Ford Windsor 302 cubic inch engine, from a 1969 Ford Torino. Competition Hi Energy Cam (part #31-218-2. 268H. 0.490" lift and 280 degree duration.) Ford 289 "4-barrel" cylinder heads. Offenhauser valve covers. Offenhauser 360 intake manifold. Edelbrock 500cfm four barrel carburetor. Volvo 240 air cleaner. Stock distributor, with breakerless ignition module inside. MSD 8.5mm Super Conductor spark plug wires. Rapid Cool remote oil filter. Cooling: stock Jaguar radiator. 16" electric fan, mounted in original shroud. 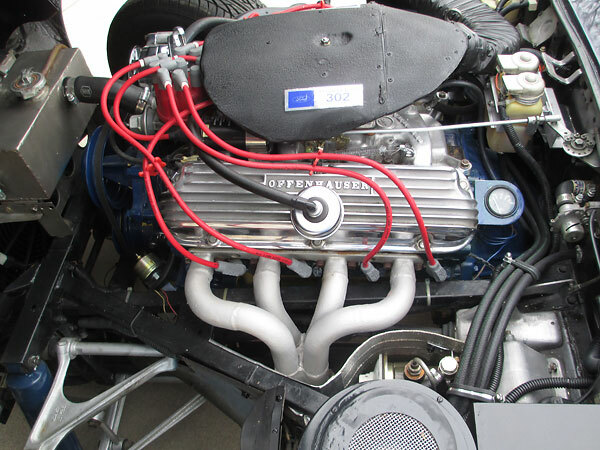 Exhaust: custom made four-into-one headers. Dual exhaust system. ANSA Automotive resonators. 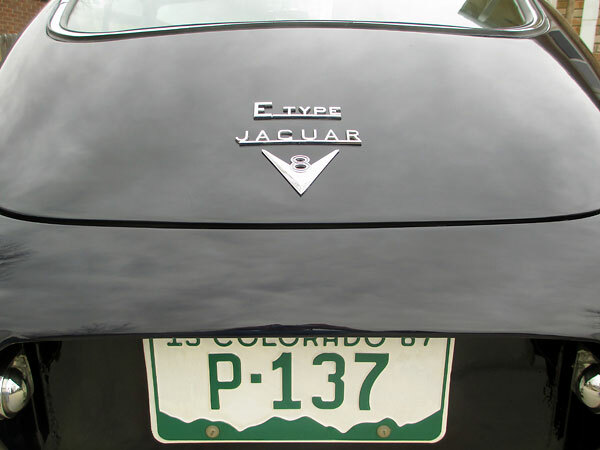 Rear End: stock Jaguar (IRS) with 3.31:1 gears. Wheels/Tires: Dayton 72-spoke 15x6 wire wheels. (Original wheels were 15x5.) Doral SDL 70 205/70R15 tires. (front) Wilwood #120-6808 calipers. Stock rotors. Body: V8 emblem mounted on rear luggage compartment lid. 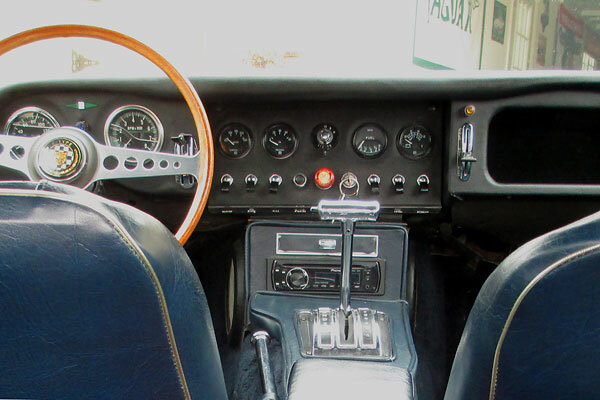 Instruments: (left to right) Stewart Warner speedometer, tachometer, water temperature gauge, and oil pressure gauge. Smiths fuel level gauge. Stewart Warner voltmeter. Electrical: Sears DieHard group 35 battery. Single-wire 100 amp Alternator. Painless Performance remote battery disconnect switch. Pioneer AM/FM/CD stereo. External radio antenna removed. Amplified radio antenna (mounted internally). Weight: curb weight is ~2820 pounds, which is ~80 pounds less than stock. Comments: this conversion was completed in August 1975, based on plans and drawings purchased from A. L. Harkless of Logan Engineering in Los Gatos, California. 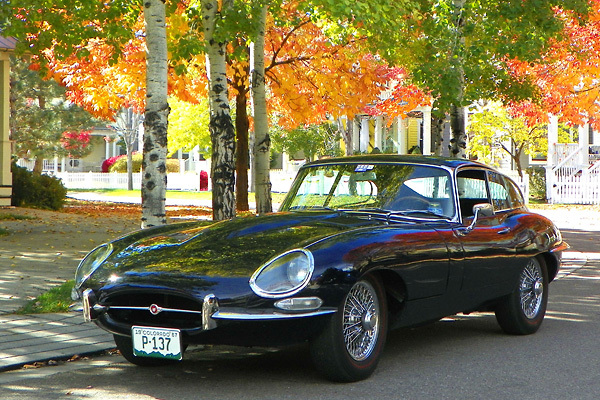 Over almost four decades, Robert has driven his V8 powered E-type over 60,000 miles. 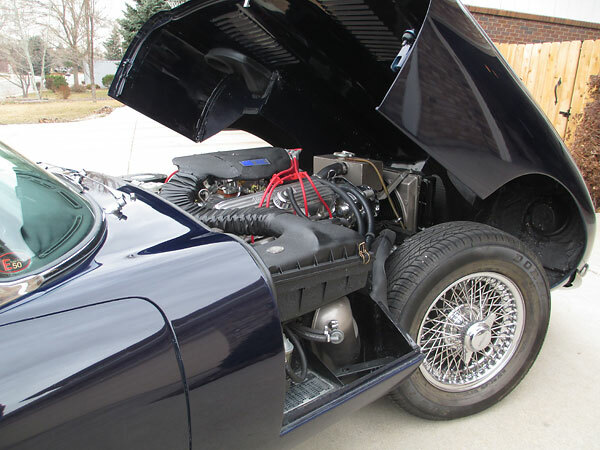 Engine and transmission were overhauled in 1988, and should provide many more years of reliable service. 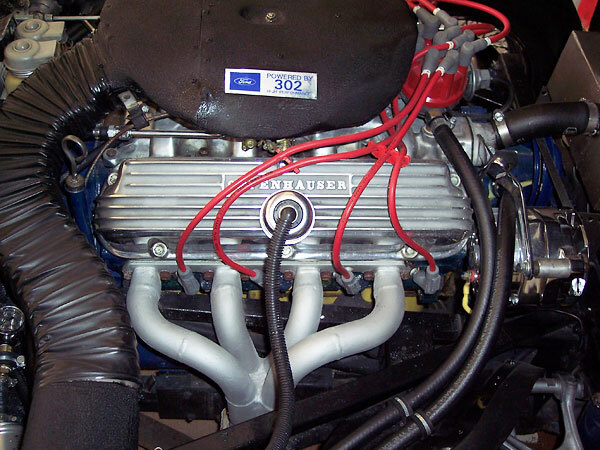 Ford Windsor 302 cubic inch engine, from a 1969 Ford Torino. These custom made four-into-one headers are 39 years old. Offenhauser finned aluminum valve covers. Offenhauser 360 intake manifold and Edelbrock 500cfm four barrel carburetor. The air cleaner has been slightly modified to connect by hose to a custom carburetor cap. 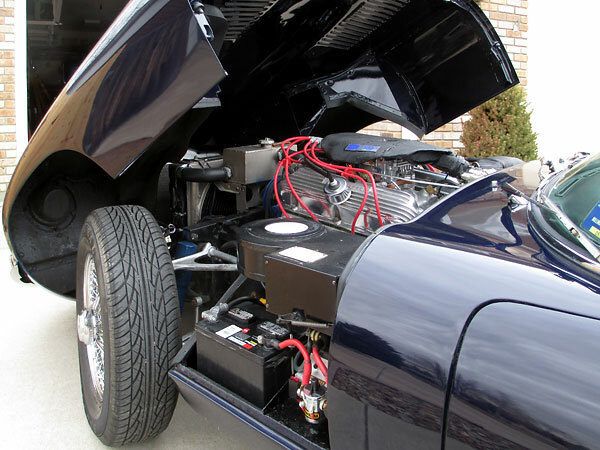 A stock 1967 Jaguar brake system vacuum tank is visible underneath the air cleaner. oil pressure gauge. Smiths fuel level gauge. Stewart Warner voltmeter. 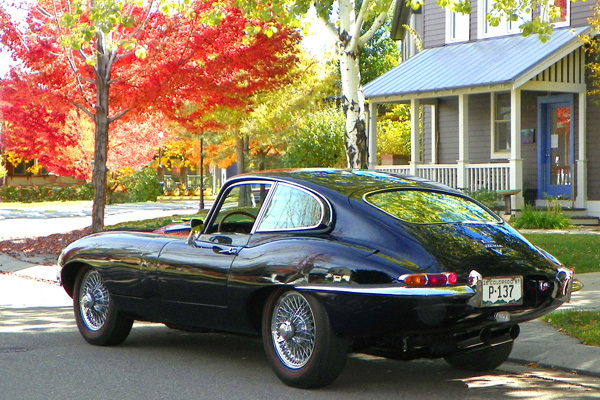 Jaguar E-type Fixed Head Coupe (FHC).